Opening Remarks to the first Public Meeting of the Ontario Anti-Racism Directorate held in Toronto, Ontario on July 15, 2016. I want to offer some words to start off this important gathering in a good way. As indigenous people we look to the guidance from the Spirit World and from our great and kind Creator, G’zhemnidoo, to provide us with direction in times of difficulty. When our lives are burdened and our spirits are hurt through our collective and respective experiences with racism. That numbing and gnawing grief we feel when we see our brothers and sisters torn down as a result of that racism. And this is a particularly difficult time for many of our brothers and sisters facing such adversity and who are working hard to get across the message that Black lives matter. We need to support and reinforce the message of those who are experiencing the worst that racism, discrimination, hate and intolerance brings. We need to support our brothers and sisters and stand by them during their time of need. We also have to look to the teachings of humanity – those original instructions and sacred law that were given to us all at the time of Creation. Our eldest ancestors were put on Mother Earth together, at the same time, and in a very real way as brothers and sisters. We can all trace our ancestors back to our Creation Story – back to our respective creation stories. The very first thing that we’re told when we learn our Creation Story is that “all creation stories are true“. That meaning, we must respect and believe in each other’s creation mythology and origin stories. To Love and appreciate one another’s culture, history and Spiritual ways of life. For the Anishinaabe, when humankind was first put on the Earth, we were lowered down in a gentle, kind way from the Spirit Realm. Our feet touched the Earth for the first time in a physical way. We’re told that there were four original brothers, the Yellow, Red, Black and White. At that time, we were all given original instructions and sacred law from the Creator. We were given two very important gifts that were not given to any other living being on the face of the Earth. Those gifts where the gift of intelligence – to be able to think and reason; and the gift of freewill, to make choices based on what is needed for ourselves and those around us. Sometime later, in a time of great need, the Anishinaabe people were given seven sacred teachings to show us how we are to interact and relate to one another, and the world around us. These Seven Grandfather Teachings don’t solely belong to Anishinaabeg people. These teachings were given to all of humanity, for us as Anishinaabe to share, teach and reinforce to all God’s creatures. Those seven teachings are the teachings of Love – to know Love is to know peace. Respect – to honour all of Creation is to know respect. Humility – to know that we are just a small part of Creation. The teachings of Bravery, Honesty, Truth and Wisdom were given to us to to reinforce our instructions to be the best people we can be. To live a good life – a philosophy we call Mno Bimaadiziwin. To live a life of hate, to live a life of hurt, to treat each other without that Love and Respect is painful to us all. It’s contradictory to our original instructions. It’s contradictory to Sacred Law. How do we begin eradicate racism, discrimination, hate and intolerance? It takes a lot for us to get out of our heads. We tend to want to overthink things, to analyze the issues and risk factors and come up with a good public policy response. But when it comes to emotional and the spiritual, we have to get out of out heads and into our hearts. We need to bring back ourselves to those original teachings that we are all brothers and sisters in Creation. We are expected to Love, Respect and Honour each other. We need to offer each other kindness and gentleness. That’s what I’m going to ask for during this prayer. That’s why I smudged this room with our sacred medicines prior to our meeting this evening. I asked the Spirit to provide us with a place where we can have a progressive, sensible and respectful dialogue. Where we need not succumb to anger or frustration. Every one of us in this room, are advocates for change and believe in this a world without racism, discrimination, hate and intolerance. We, in this room, are all going to be part of the solution. And I’m a firm believer that Canada, and the vast majority of people that make up this beautiful multicultural mosaic, truly embody the Seven Grandfather teachings. With much credit and Love to our teacher, Bawdwaywidun Binaise. Gchi-miigwetch, gchi-gimaa ni ge’kinoomaaged. Today, I am pleased to announce something new: Anishinaabe.ca. I’m pleased to launch the re-design of my website and blog and re-dedicate it to the most sacred name in the Anishinaabemowin (Ojibway) language. Anishinaabe isn’t just the word for us indigenous people from this part of the world. It is the name of the very first person that walked Mother Earth. According to our Creation Story, long before he received his given-Spirit name, Waynaboozhoo, Original Man was lowered to the Earth by the Creator directly from the Spirit World. At first he was called Msko-Gaabwid, the red standing one. Our oldest story, teachings and sacred scrolls referred to him as “Anishinaabe”. Grand Chief Edward Benton-Banai explains the etymology of the word as ANI (from whence) NISHINA (lowered) ABE (the male of the species). For us, who are derived from our eldest ancestor – being Anishinaabe is everything we are. It is our flesh and blood, our race, identity, language, nation and our creed. This website will henceforth be known as Anishinaabe.ca. The new design also pays homage to Chief Shingwauk (1773-1854), the head man who led the negotiation and signing of the Robinson Huron Treaty. 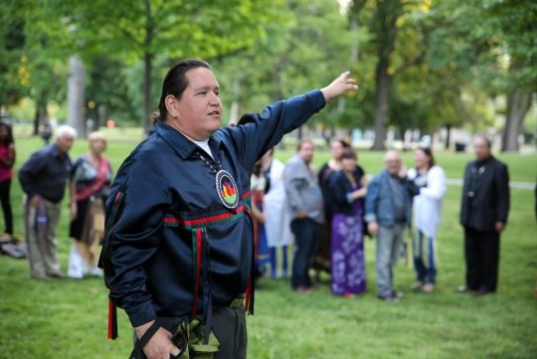 He was also a well-known and respected Midewiwin leader. Chief Shingwauk has a vision of a great teaching lodge based on the Midewiwin teachings and education for all First Nations people. The new design also pays tribute to the great landscape and spectacular vistas of the Great Lake territory, Anishinaabe-aki. Improved design and functionality, through WordPress CMS. Podcast and Video Blog features and functionality. Subscription through RSS web feed. Mobile site functionality when accessed by Iphone, Ipod, Palm WebOS, certain Blackberrys and Android devices. A new logo and new graphics. I’d like to thank my partner, Deborah for her patience and feedback, Arnya for your feedback, Vicky Laforge & Clear Skies Photography for the amazing images, Shrabanti and the Web Guru Team and to all open source coders and developers everywhere. Most of all, chi-miigwetch to all of you, the readers. I hope you enjoy the site.